Ted Rand died this weekend. He was a gifted artist. The Seattle Times and Seattle Post-Intelligencer have tributes to this wonderful man whose work inspired the imagination of so many children. "He always said he felt the most satisfied when he worked on the children's books, that he was using what he could do the best way," said Gloria Rand. 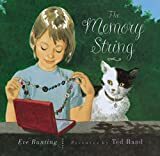 His career began when Bill Martin Jr., a well-known children's author, spotted a painting by Mr. Rand and recruited him to illustrate one of his books. Two of his most widely sold works were the illustrations for "The Ghost-Eye Tree" and "Here are My Hands," both written by Martin. He also collaborated with his wife to produce 12 books. Their final effort together, "A Pen Pal for Max," is scheduled for release later this year.